EIFS/ CI products fall under these catagories: EIFS, Stucco, Plaster – called Synthetic Stucco. 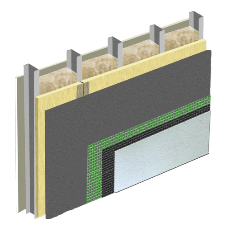 EIFS refers to an exterior finish with multiple layers that utilizes insulation on the exterior of the building. This method of construction has been used since the reconstruction of Europe after World War II. Builders found that EIFS was a good repair choice for buildings damaged during the War. The majority of repairs to European buildings were to structures constructed of stone, concrete, brick, or other similar, durable materials. 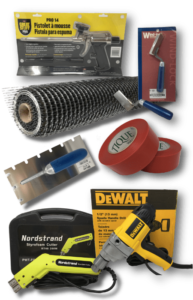 EIFS DEPOT is proud to offer superior CI / EIFS and stucco supplies to our customers at GREAT PRICES! EIFS DEPOT has more than just EIFS. Call us today for information on Hard Coat Stucco, Plastering, and Drywall material. We supply Metal Lath, Fiber Sanded Stucco and various trim pieces in different sizes. Whether you are looking for corner bead, casing bead, or expansion joints, we are the go to experts. EIFS DEPOT is also the place to buy your Mechanical Fasteners. Our Mechanical Fasteners are pre-assembled galvanized steel screws and a 2″ plastic stop washer. Mechanical Fasteners are great for screwing EPS Foam Board to OSB, Plywood, and Light Metal substrates. We pride ourselves in making custom made Architectural Foam Shapes to your specifications. All we need is a drawing with dimensions and we can create beautiful Architectural Shapes. Architectural Shapes add depth and beauty to any building at a very affordable price. Also be sure to use high quality stucco products such as: Tique Basecoat Adhesive, Tique Acrylic Finishes, and Tique AquaGuard. we are the go to experts. Also be sure to use high quality stucco products such as: Tique Basecoat Adhesive, Tique Acrylic Finishes,and Tique AquaGuard.